Dental pain can be one of the worst kinds of pain you may experience. Smile Cliniq Emergency dentist London offer emergency dental services to patients at our Smile Cliniq branches in St. Johns Wood and Finchley. Our branches are well located and easy to get to in London. An emergency dental situation can unfortunately arise at any time and affect our busy schedules, so give us a call and trust us to take care of your emergency in a professional and caring manner. Our lovely receptionist will book you in and we will see you on the same day in case of an emergency. If you are experiencing any of these then call one of our clinics and book an appointment to see an emergency dentist in London today. A broken tooth could either be a chipped front tooth, collapse of a wall of a back tooth, a crown that breaks off or a filling that comes loose. A tooth breaks mostly due to underlying decay making the tooth week or excessive biting forces due to an unfavourable occlusion. There can be nothing more socially debilitating than a broken tooth seen while smiling. A broken tooth could turn into a dental emergency as it could be sharp and hurt the tongue and cheeks, it could expose the inner dentine causing severe sensitivity while having hot or cold foods or even by the cold London breeze. When booked in to see one of our emergency dentists in London, our dentist will first assess the cause of the emergency. In case of a broken tooth in the smile line, we make sure you leave being able to smile again. In case of a broken tooth at the back causing pain, a filling (restoration) should normally be enough for same day dental pain relief treatment. If there is extensive damage to the tooth, our dental team will give you the options, prices, risks and benefits of other available treatments. Anyone who has suffered from a toothache will tell you, it is one of the most excruciating of pains our bodies can experience. A toothache is often described as a sharp pain, throbbing pain, pain around one side of the face that goes up to the back of your head and to one side of the jaw. The cause of the pain is actually our body’s reaction to fighting disease. When tooth decay spreads, the bacteria present migrate towards the pulp tissue in the canal. To fight this off there is increased blood pressure to the pulpal tissue in the canal causing inflammation. This inflammation causes increased pressure in the canal thus impinging the nerve fibres resulting in severe pain. If this pain is ignored or subdued by taking anti-inflammatories and pain killers, we end up ignoring the problem, this could lead to spread of inflammation and infection into the bone and gums and even cause a swelling to the face. To avoid this from escalating, it is important you call our London dental centres and we shall deal with it with our same day dental emergency services. At your emergency appointment we shall do a thorough examination of the tooth hurting you and discuss the severity of the issue. Based on the extent of infection we may either need to prescribe antibiotics or provide same day dental pain treatment. This is done by numbing the tooth and relieving the pressure. We will then discuss the long term prognosis of the tooth and the various options available for treatment. Dental Abscess can be mainly of two kinds. It can be due to the pulpal infection not being treated as described above or even due to poor gum health around a specific tooth or teeth. This is known as periodontitis. When sufficient hygiene protocols are not followed or there is a tooth that is particularly difficult to clean, it gives rise to gum disease. The bacteria then migrate from your gums into the supporting bone and this destruction leads to the formation of pus or infection. You will notice a small swelling or lump on your gums, foul odour and salty taste in your mouth. When this happens it most likely due to an abscess draining pus. To prevent this from leading to a swelling of the face and having loose teeth, it is best you are seen by our emergency dental team. The dentists at our London clinics will make sure to locate the cause of the issue and treat it promptly by either draining the abscess, cleaning the area or by prescribing antibiotics needed to decrease the bacterial load allowing treatment of the area in the future. We will also give you a treatment plan to deal with the gum disease and a suggest a protocol for preventive care. Metal and ceramic dental crowns are supported by the dentin or a core buildup material (such as metal, composite or fibre reinforced posts and cores). When these dental cores weaken due to decay or excessive forces, the crowns may come loose or fall off. Sometimes it is just the cement that’s holding the crown that dissolves over time rendering the crown loose. 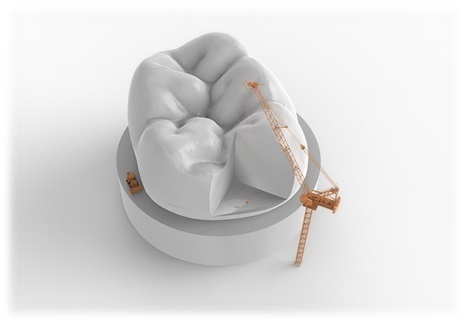 Our London dental team know exactly what to do in such situations and will offer to re cement or bond the crown back or on occasions may recommend reinforcing the tooth with a dental post and core before fabricating a new custom made dental crown. 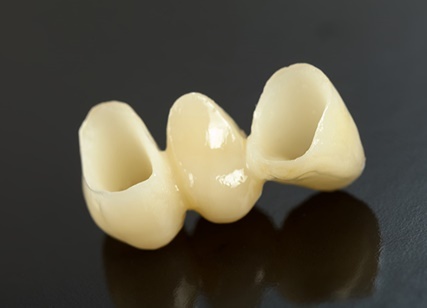 A dental bridge is a prosthetic design of artificial crowns linked to bridge two teeth and replace a missing tooth or teeth in between. We will assess the reason the bridge fell off or broke and our team will then find a way, if possible, to re-cement the broken prosthesis to avoid you having missing teeth and also prevent further damage. If this is not possible we will then plan to make a new bridge. It is now the norm for most people in London to have missing teeth replaced by dental implants as they are the most functional as well as aesthetic replacement for natural teeth. Although dental implants last for years to come, they need regular care and sometimes a bit of maintenance. You may notice an implant might have come loose but you need not panic as it isn’t always the implant that’s loose. 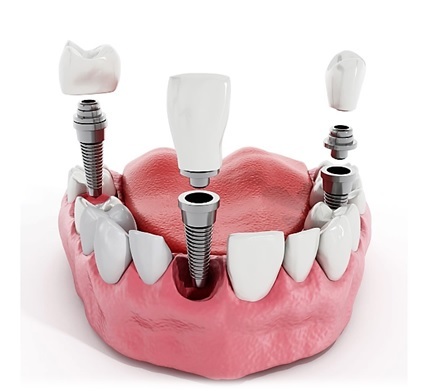 Mostly it is just the crown or the intermediate part holding the implant and crown called the implant abutment that comes loose. You may also notice a piece of the crown may have chipped off. Our clinical team of dental implantologists at both our London dental clinics will be able to examine and diagnose the problem as well as the cause of the problem. We may need to simply tighten the abutment or re cement the crown and make sure the occlusion is favourable for proper implant function. As we have evolved, our jaw sizes have become smaller. We no longer need large jaws and molars due to the changes in our diet decreasing masticatory force demands. This has led us to not having sufficient space for eruption of the wisdom teeth or third molars. 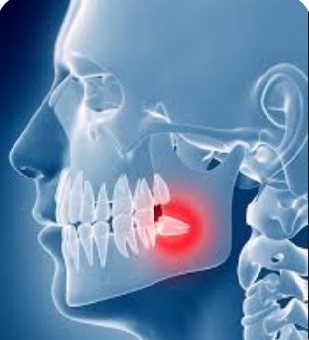 The wisdom teeth then get locked into the jaw or find an unsuitable position that makes access to clean difficult. This area if left unclean acts as a reservoir of plaque which is a breeding ground for bacteria and causes decay of the wisdom tooth or adjacent teeth. Very often the cause of the pain is due to a swelling of the gum in the region, this is a condition known as pericoronitis and is painful on jaw movements and biting. 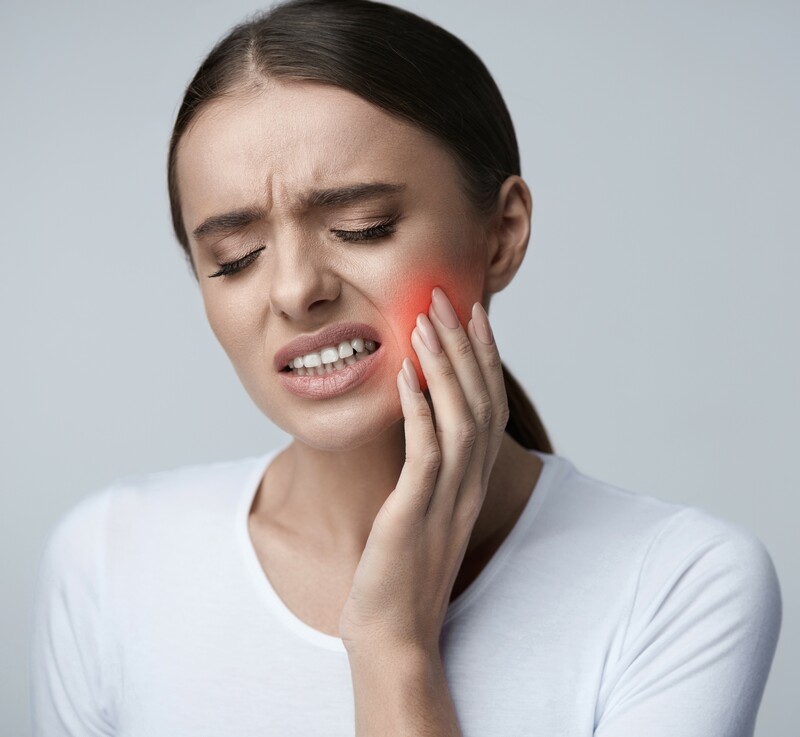 Our emergency dental team will need to review the position of the wisdom tooth and the history of disease and deal with the symptoms of the pain. The same day dental pain treatment could range from a simple cleaning to antibiotic prescription or third molar extraction. If you need extraction of your wisdom tooth, we have the option of having it done under sedation making it a rather stress free procedure. Trauma to the face due to an unfortunate accident can be one of the most distressing of situations to deal with. This could simply be a chipped front tooth to broken teeth and ulcerated tissues. To deal with this kind of an emergency we have a team of trained dentists some of whom have worked in the A & E. We will see you as soon as possible on the very same day and make sure to provide the best of care. During the appointment we will do a thorough examination of the head, face and neck to rule out any damage to the muscles and tissues. We will also examine the full jaw and joint and possibly take a large radiograph to rule out any fractures of the teeth and jaws. Following that we will evaluate the hard and soft tissues. Based on the extent of trauma, you may need to be dealt with our multidisciplinary team to best manage the trauma as well as to formulate a plan get you smiling back again. Mouth ulcers are characterised by a break in tissue in your mouth which is normally a small rounded region with an inflamed reddish border. These can be single or multiple in origin and are mostly seen along the borders of the tongue, the palate, gums, lips and inside of the cheeks. 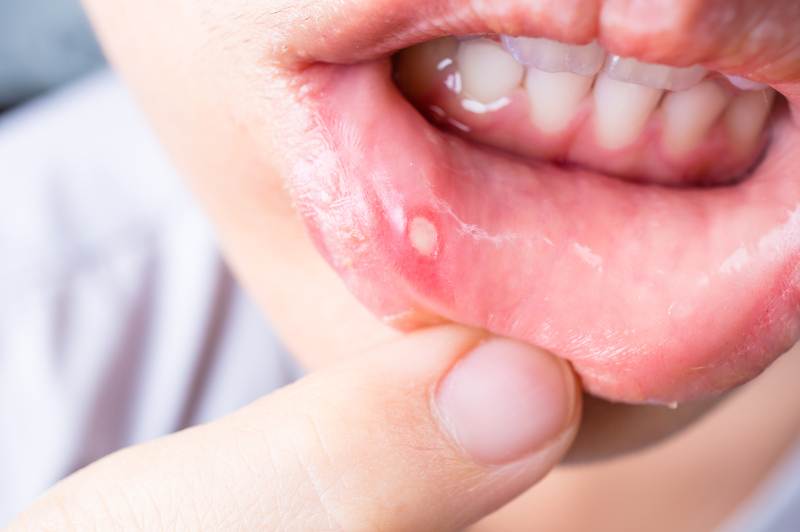 Common symptoms of mouth ulcers are a burning (pain) sensation while eating or drinking, discomfort on eating spicy and hot foods, loss of appetite, mild swelling of the surrounding tissues, inability to brush properly due to pain and discomfort. Causes: ulcers can be caused due to various reasons such as intra-oral trauma, poor hygiene, burns, decreased immunity, herpes simplex viral infections, a sharp tooth, denture or orthodontic wire, reaction to medication, diseases such as hand foot and mouth disease, AIDS, tuberculosis and even diabetes. Ulcers normally heal within a few weeks but recurrent or long standing could be dangerous as they can lead to infection, cellulitis and can also be precancerous lesions. Hence, we advise patients to call us at our London dental clinics to diagnose and treat appropriately. Recommended treatment can range from symptomatic relief by avoiding hot and spicy foods, drink plenty of fluids, saline mouth rinses and good oral hygiene. We may also need to prescribe pain relief and anti-inflammatory tablets, antiseptic gels, steroid gels or even antifungal, antiviral and immunosuppressive medication. As more and more Londoners are conscious about their smile, there is an increase in demand for orthodontic treatment. Orthodontic treatment can cause discomfort in the first few days your teeth are subjected to new forces. 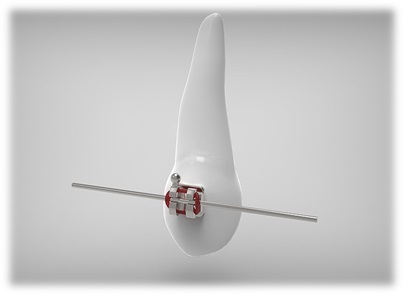 Fixed orthodontic appliances have multiple components. Sometimes the brackets bonded could come loose, the bracket itself could be abrasive or the wire could also lengthen towards the back as the teeth move in line. We always provide our patients with sticky dental wax to clock out any sharp components. We advise you clean the area, roll a piece of wax till it becomes a bit warm and sticky. The wax then has to be placed over the sharp component. A quick emergency visit to our London clinics could relieve you off the pain and avoid any ulcers as we can easily cut the excess wire or re cement any loose brackets. Doing this can also avoid any loss in treatment time that could result due to inactive components. Apart from dealing with the cause of the problem, our professional team will reassure you, making sure you have the best possible treatment. In case you find yourself in any of the above conditions, please feel free to call one of our London dental clinics. Our emergency dental team will make sure you receive same day dental pain treatment and skilfully manage your dental emergency. Have a toothache? Is your cheek swollen? Broken your tooth? Need an emergency dentist appointment with a dentist in London? Smile Cliniq is here to help! Smile Cliniq can offer emergency appointments to patients in London who require emergency dental treatment. Caring and friendly dentists at Smile Cliniq in London will identify the cause of pain and discomfort and provide you with the best suited advice and treatment to get you out of pain. Our dentists understand it can be very frightening or nerve-wracking for some patients to visit the dentist. For nervous dental patients, we can offer IV sedation to carry out treatment if necessary after an initial emergency dental appointment. An emergency appointment costs £45 and Smile Cliniq endeavours to see you as soon as possible.